Projector Bike leavesEdinburgh Gardens in Fitzroy and takes a ride through this unique suburb exploring its bike paths and blank walls! We will meet at the basketball court. Showing award-winning short films with a fresh playlist every week, join us as we meander through Fitzroy on a unique once off magical mystery tour. 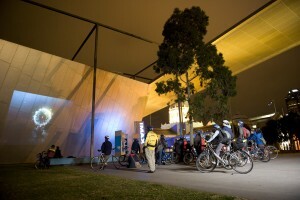 Bring your bike and meet at Edinburgh Gardens in Fitzroy, or catch up with us via Twitter updates. Projector Bike will be situated in the middle of the basketball court playing music. Testing Grounds is now closed for the winter so this is part of our winter Friday rides project ‘Projector Bike in Your Burb’.